In order to develop a secure defense against a hostile alien race's next attack, government agencies breed child geniuses and train them as soldiers. A brilliant young boy, Andrew "Ender" Wiggin lives with his kind but distant parents, his sadistic brother Peter, and the person he loves more than anyone else, his sister Valentine. Peter and Valentine were candidates for the soldier-training program but didn't make the cut--young Ender is the Wiggin drafted to the orbiting Battle School for rigorous military training. Ender's skills make him a leader in school and respected in the Battle Room, where children play at mock battles in zero gravity. 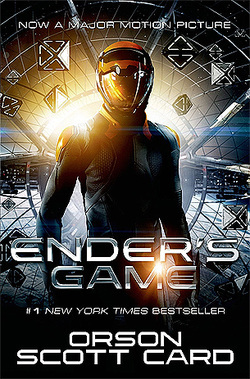 Yet growing up in an artificial community of young soldiers, Ender suffers greatly from isolation, rivalry from his peers, pressure from the adult teachers, and an unsettling fear of the alien invaders. His psychological battles include loneliness, fear that he is becoming like the cruel brother he remembers, and fanning the flames of devotion to his beloved sister.